Avecinia Wellness Center is Clovis and Fresno’s premier choice for primary care, aesthetics (skincare) and alternative therapies (acupuncture, massage). We practice integrative medicine by integrating the practice of Internal Medicine/Primary Care with several different, proven holistic approaches to well-being. This includes Acupuncture, Massage Therapy, Health Management, Weight Management,and Aesthetic Services. Through the use of communication tools such as our patient portal and social media (Blog,Facebook, Pinterest, Twitter & YouTube) we empower our patients and the community and achieve our goal of helping you reach your optimal well-being! The familiar environment of your home cannot be equaled by any care facility. This is why staying at home fosters good health and speedier recovery. To us, your home is a workplace and we are serious with our profession. Driven to bringing excellent health care to your home and to meet and exceed your satisfaction, our team of nurses, therapists, medical social workers and case managers at Therapeutic Home Healthcare are at your service! We are a provider of home health care programs to patients and families who need support services for conditions such as recovering from an injury, managing a disability, or regaining health after a major surgery. To those in need of assistance with daily living activities, we also provide short-term and long-term care arrangements depending on your needs. We know that you demand the best for you and your family. You will be happy to know that we support you one hundred percent. Expect nothing less than excellent home health care services from Therapeutic Home Health. At Sierra Vista Healthcare, our guiding principle is to provide outstanding and innovative healthcare in an environment that remembers the importance of the individual and family. Our staff of dedicated professionals embodies the values that we cherish most – a nurturing spirit and a commitment to quality. Our friendly and caring team provides Sierra Vista residents with personalized therapeutic attention around the clock. We also pay attention to the small details to make your stay most comfortable. From sunny patient rooms to tranquil common areas and lounges, and tasty dining services – we strive to make Sierra Vista Healthcare relaxed and enjoyable. We welcome you to visit and tour Sierra Vista Healthcare Center soon. Dr. Rasheed Amireh – Board Certified & Fellowship Trained. Bethany Clague has been practicing as a licensed massage therapist for over a decade. She is certified in SwedishMassage, Shiatsu, Reflexology, Hot Stone Therapy, Restorative Yoga, Esthetics, and Reiki I & II. She is currently studying Craniosacral Therapy through the Upledger Institute. 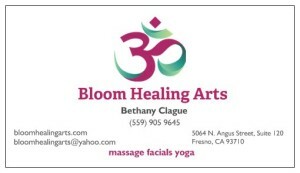 Located in central Fresno, Bloom Healing Arts is a serene space in which Bethany offers massage (including couples), facials, and private restorative yoga sessions. Incorporating aromatherapy, heat, and music, Bethany takes you on a journey of the senses to help you find a deep sense of relaxation. In this space of serenity, your body’sinnate ability to heal itself is fully supported and encouraged.